The Coast House has been FULL in so many ways lately. Full of people, full of the Holy Spirit, and full of a hunger for more of God! We’re seeing some lives changed, transformed into something truly beautiful. There are a lot of great things coming up (Resurrection Sunday, Coast en Español, Youth Rally in May, Full Bible study course on Midweek) but we don’t want to rush past what God is DOING right here and now. We’d love for you to be a part of it, actually, we’ve been praying for you to be a part of it. What’s stopping you? Have you ever wondered WHERE God may call you? What the future may hold? Well, we may not all be called to serve God in other countries but one thing is for sure: we CAN support those who serve in foreign lands. Yesterday was MISSIONS SUNDAY at Coast Church Ventura and it was an absolute honor to have the Sponsler Family who is currently serving in Buenos Aires, Argentina. The lead an effort to train, lead, and serve the ministers and families of a growing organization of Pentecostal ministers in Argentina. The miraculous things they’re seeing in Argentina brought tears to our eyes, joy to our heart, and made us feel elated to be partnering with the Sponslers to help reach the beautiful people of Argentina. Stories of miracles of healing, divine protection (a pastor who was held at gunpoint and simply prayed for God’s protection and then heard the gun fire yet the bullet simply bounce off of his skin, a young lady who’s hand was severely maimed while working in a commercial kitchen but was restored 100% to working use, a young toddler whose lungs were filled with fluid and went into a coma but was healed miraculously within 24 hours), and the Gospel being spread into many places in Argentina. It was truly an awesome day! A photo of the skin where a bullet bounced off of a young pastor after being robbed and then shot at point blank range. The bullet is held in his hand. He cried out to God to protect him and the assailants ran away! Truly we are seeing awakening and world wide revival. You may not be able to “give by going” but you can certainly “go by giving.” We’re thankful that Coast Church has been positioned into a place of generosity to support brave families like the Sponslers who are leading revival around the world. This is an original post from Brandon & Jamie on their Facebook and it quickly became popular, received hundreds of likes and numerous shares. We felt that since it struck a chord with so many people there, we should share it here for others to read (with permission from the author of course). Maybe you’ve asked the question, “why would someone go to a new, small church when they could go to a big one that has better music, programs, and is more polished/professional?” We don’t have all the answers to that but here is an answer from one of our members who had the same question. Most everyone who knows me knows that I grew up at First Pentecostal Church in Pensacola, FL. FPC is a fairly large church so naturally as the Navy moved Jamie and I around the country we looked for churches that were like what we grew up in. The one thing they all had in common (Besides being UPC). Size. When we got stationed here in California we visited the churches that would typically fit us. We soon found out that search was futile, but I’ll get to that later. As we went from church to church we just didn’t get the feeling like we belonged anywhere. It wasn’t because the Holy Ghost wasn’t present or that the people were unfriendly, because we went to some really nice places that we thought could be it. It was more like we got the feeling that GOD was just saying… Nah… This ain’t it. Keep looking. So keep looking we did and during our search we came across Coast Church. Sunday comes and we punch in the address, but when we get there it looks like it’s in an abandoned warehouse. I’m getting ready to keep on driving because, let’s be serious I’m not trying to become someone’s blood sacrifice at some cult service in a warehouse. But Jamie, being the ever adventurous one, was like “Well, we drove all the way over here might as well check it out”. So I huff loudly as I back into a spot close to an exit just in case we have to make a quick escape. Check my CCW pistol… Locked and loaded… Take a deep breath… think to myself remember the details on the way in so you know how to get out! We walk inside and the music was instantly recognizable as was the worship. So with that putting me at ease we walked into the sanctuary. It was really nice and the praise was so powerful you could feel it. But we there was a “small” problem. It was well… Small (pun intended). There were all of 10 adults there including us. So Im thinking to myself kinda telling GOD… You see GOD, Jamie and I just aren’t comfortable in a small church. Both of us have always been part of larger assemblies so “small" just isn’t going to work for us ok? Soooo we are gonna keep looking. Except during the next week neither one of us could shake the feeling like GOD was saying NOPE… Sorry guys, this is it. This is where you are supposed to be. So after a little struggle and a lot of prayer we decided to make Coast our home away from home. Well we started looking for other buildings but everything kept falling through. Jan. 1 came and we were basically on the street. Bouncing around from one community center to the next and watching the attendance seemingly drop to nothing. It was honestly starting to look as if it really were over. That’s when a store front opened up. I mean it’s right next to a laundry mat and a liquor store. Not exactly an ideal location for a church but hey it’s a place and it would be our own. Now that we have our building we run into a new problem. We have to turn a store into a church. It requires an entire renovation on the inside that was going to cost almost everything the church had and not only that we would still have to furnish it. Now I don’t know if I mentioned it or not but we are a small church. How in the world are we even going to do all this? Spoiler alert… WE aren’t. We have to let go and let GOD. Now with the time difference between Pensacola and Ventura I can still live stream most of the FPC services. While watching one night I got to wondering what happened to the chairs that used to be in the choir loft at FPC. So I asked my dad to talk to Pastor Kinsey and see if maybe they had them in a closet or storage somewhere and if so maybe he would be willing donate them. Because just the choir loft chairs would be plenty enough for our church. Pastor Kinsey instead of donating some old used equipment responded a few weeks later with a check that completely covered our renovation costs. Our Coast family was blown away and SO very grateful for the generosity of a church that was 2000 miles away on the complete other side of the country. A church I have been proud to call home since birth. By the grace of GOD, it wasn’t just FPC but people from all over started donating. Some people who were not even Christians but saw what we were doing and said they just felt compelled to give. Words just cannot express how big a move of GOD this was nor how thankful we are to everyone. Easter Sunday was set as the day we wanted to have our first service in our new building. So last Saturday morning we meet down at the church to hand out fliers and invite as many people as possible to the service. Jamie and I spent a couple of hours doing that and I could count on my fingers how many times I have done that before… if I had no fingers. Afterward we stayed until 10pm hanging lights, door knobs, shelves, installing towel holders and soap dispensers. All these things that typically "someone else” would have done. We started our first service at our new location in the same manner we ended with at our last location. Singing “YOU MADE A WAY! When our backs were against the wall and it looked as if it was over, YOU made a way, and we’re standing here only because you made a way!! !” Make a way he did, Easter Sunday was a massive success. We had 40+ people at each service and then again this week we had over 50. But the thing is most of them were new people who just came for Easter service. Suddenly it turns out the same spot I thought was far less than ideal to us to put a church… GOD says… “Nah, see that’s EXACTLY where I wanted it.” The amount of people who walk past then stop and ask about it is amazing. I’ve never heard so many people say “I’m really glad a church is going in here”. So after all the doubts and reservations I had now I’m really starting to believe that anything is possible. Now I’m just waiting for the person walking to the Liquor store who is empty inside going to try to fill the void with Fireball liquor to stop here first and get filled instead with the Holy Ghost and fire. I BELIEVE THAT IT’S GOING TO HAPPEN! I know this was really long (thanks for staying with me!) but I really felt like it needed to be told in its entirety. There are two very important lessons I learned along the way that I would like to impart with everyone. The first is be ever vigilant of complacency. It’s the #1 Killer in Naval Aviation. Every day our maintenance control warns us about the dangers of it and to keep your head on a swivel. Complacency KILLS! But wouldn’t you know it the Bible also warns us that it’s just as dangerous in the church house. We are warned by the attitude of the church of Laodicea. Never let complacency set in, otherwise you may find yourself just going through the motions and thus spewed out of his mouth. Or even worse rocks may just cry out in your place. The second is a message that Pastor Kinsey preached a little while ago about Shamgar and his oxgoad. The lesson is simply to start now where you are, use what you have, do what you can, and with GOD it WILL WITHOUT FAIL be enough. Coast Church is living proof of that. Pastor Scott (the pastor here at CC) talked about intimacy with GOD and his blessings this morning. Which made me realize every time I turn around he is blessing us, so much so I literally can’t remember all the blessings. So keep the prayers for us, the city of Ventura, and the nation as a whole coming. 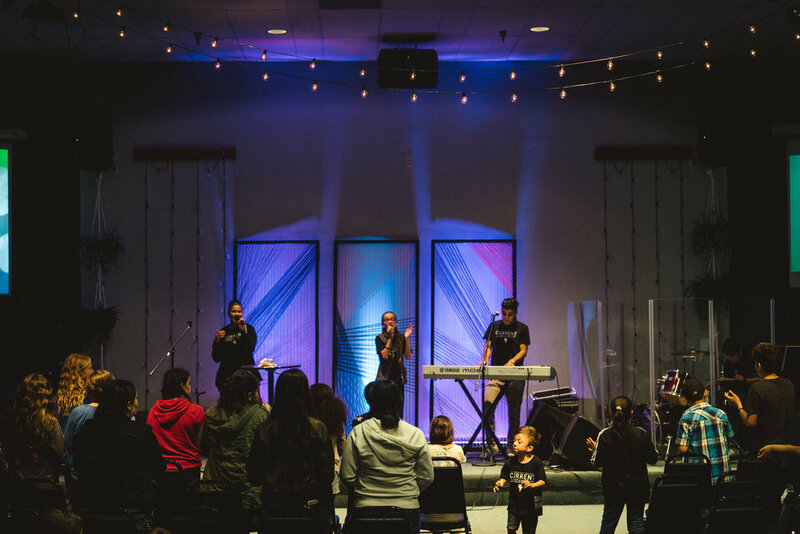 Because while churches all over the country are closing their doors, I can’t help but believe that Coast Church in Ventura is just getting warmed up. I know FPC feels the same way! FINAL THING I said twice in the beginning because I spent a couple of hours typing this up only to have the FB app force close as I tried to post it and erase the whole thing. But you know what… as aggravated as it made me I had time to write it again… SO NOT TODAY DEVIL!!! Well, if you haven't been following us on Instagram (you totally should, here) you've been missing out on all the updates about what God is doing through Coast Church. Earlier this month we received the keys to our new storefront location in Bristol Center, located in the Montalvo neighborhood of Ventura. We've been doing some remodeling (huge thank you to everyone who has been donating financially and with their time to make this a possibility) and getting the building ready for our GRAND OPENING APRIL 1st, RESURRECTION SUNDAY. It has been a trying time for us at Coast since the Thomas Fire in Ventura and then losing our lease at the previous location...BUT GOD has opened up an incredible door for us to serve our community here in Montalvo. It is clearly evident that God wants a vibrant, life-giving, multicultural, generous, Spirit filled/led, multigenerational, and creative church here in Ventura. 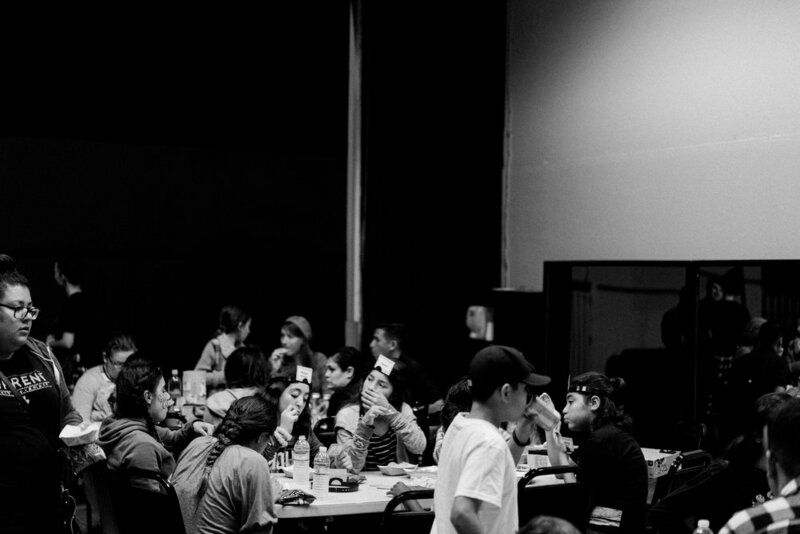 We aim to be that church and we strive to be a place where people BELONG. BELIEVE. BECOME. From fresh texture, new fixtures, a sparkling coat of paint, and refinished epoxy floors...our volunteer team has been making the new Coast House beautiful and inviting. We will also have a brand new Coast Kids room ready for our children to learn all about God's great love in Sunday School. As we move into the new location we're looking forward to resuming our Current Youth Nights (middle and high school student gatherings with music, preaching, prayer, and a lot of fun), launching an after school program, substance abuse/recovery classes, Bible studies, music and creative workshops, leadership sessions, and more. 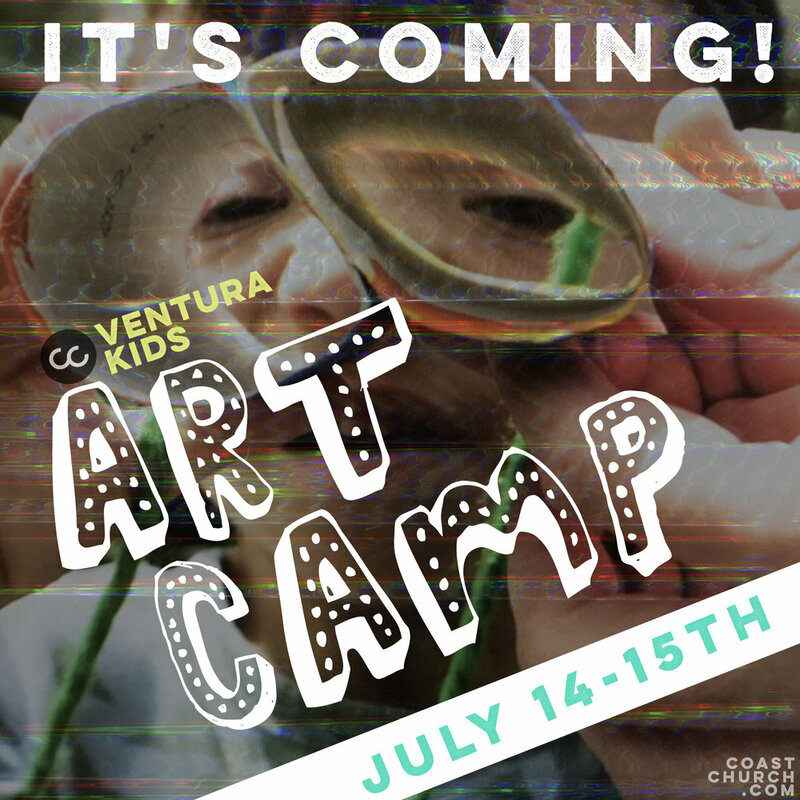 This year is our FIRST EVER Ventura Kids Art Camp and we are so excited about it! We want our kids to enjoy the process of CREATING art projects, being inspired by God's creativity on earth, and making new friends at art camp. TWO DAYS only and ages 4-12 are welcome. You could call this a VBS (Vacation Bible School) but we're a little different at Coast Church Ventura so we like to just call it Art Camp. To sign up text 805-215-3558. The camp is FREE to all kids in Ventura County. Projects include: stencil art, slime, street art for kids, t-shirt making, etc. Talented musicians, young people singing Christmas songs, skits, creative media, and special guest: Peter Bingley...you won't want to miss Christmas at Coast this year. Invite a friend, bring your family, and enjoy a Sunday of celebrating Christmas. P.S. Those of you who would like to join us, we are going Christmas caroling on Friday 12/16 at a few convalescent and retirement homes, then we'll be downtown Ventura. Email/contact for more info. WHO: Open to everyone and FREE to attend. Who were the "wise men" and why did they come so far? How did Joseph feel about his virgin fiancee becoming pregnant? Why was nobody "that important" there for the birth of the most important man ever born? These are some of the things that we will talking about as we read the STORY OF JESUS in an intimate setting on Christmas Eve Eve Eve (better known as the Thursday before Christmas). Instead of our Coast Groups (small groups Bible study) in Ventura, Oxnard, and Calabasas we will gather at the church to take time and hear the STORY...like we've never heard it before! Let Christ come alive this Christmas, hear the STORY, and be inspired by the MIRACLE that was Jesus' birth in a manger 2000 years ago. WHO: Open to all, bring your friends and family. Is "Going to Church" Still Important? We live busier lives than ever before. Sundays can be our only time to "catch up" and shop for groceries...that is if we don't have a baseball/football/soccer tournament or if we're not invited to a party somewhere or headed out to Ventura's beautiful beaches. So why can't I just check the podcast, re-watch the livestream, or do church once a month? That's good enough right? A few weeks ago an online post from a major ministry struck a nerve when it stated the necessity of church attendance for your growth as a believer in Christ. It’s surprising to me how many Christians struggle with the idea of church attendance. We are at a crossroads in our nation on the importance of going to church. According to research, church attendance has remained virtually the same percent of our national population for the past 70 years, however, this still means there are a huge number of American Christians who are not active in a local church—in the tens of millions. Of course, this isn’t a new problem. Since the beginning of Christianity, the early leaders had to challenge this mindset, saying, “Do not give up meeting together, as some are in the habit of doing, but encourage one another—and all the more as you see the Day approaching” (Hebrews 10:25). A popular Christian social media catch-phrase is, “You don’t go to church, you are the church.” While I get the sentiment in some ways, this is an unhealthy view, pitting “being the church” and “going to church” against each other. If we are truly “the church,” then we will surely get together with other believers regularly. We cannot “be” the church, if we don’t “go” to church. Not fully anyways. The “church” never connotes a single, individual, lone ranger Christian just going about his Christian duties and never gathering together to worship with other believers. The “church” by its very nature means multiple believers: “Where two or three are gathered in my name, there am I among them” (Matthew 18:20). This is both the biblical and historical pattern set forth for us by the first followers of Jesus. They would get together weekly to worship God together, and at times even daily. They would also share community together in each other’s homes. Paul and the other Apostle’s letters were actually sent to these church communities that gathered in various cities to be read aloud together. Church means getting together with other believers to worship Jesus Christ, and hear the Scriptures together, and encourage one another in the faith. Craig Groeschel shared recently, “There is something better. To worship God together and be committed to worship Him together, to hear His Word together. Do not reduce church to listening to a podcast. It’s so much more than that. It’s community. It’s worshiping with other, praying for others, hurting with others, serving others, being involved in the lives of others. And here’s the reality of the biblical call to gather with other believers. There are many options for going to church for each of us. You can look for a church that is right for you. I’m not telling you to go to a certain style, type or denomination of church—I’m simply challenging you to gather with other believers regularly to worship and hear the Scriptures. Every Christian should gather together to hear the Scriptures and worship Jesus together with other believers weekly (see Acts 20:7; 1 Corinthians 16:2; Acts 2:42; Colossians 3:16; 1 Corinthians 16:19; Colossians 4:15; Romans 16:5; Acts 20:20; James 2:2; Psalm 84:4; Psalm 37:17; Psalm 92:13). It is also good to meet for smaller groups of Christian community in each other’s homes regularly (see Acts 2:46). It’s good to have leaders overseeing the work and needs of each local church—this is the biblical pattern—not all of us are called to church leadership, and so we should submit to and serve whoever God has called to lead at the place we find ourselves (see Acts 14:23; Titus 1:5; Hebrews 13:7, 17; 1 Timothy 5:17; 1 Thessalonians 5:12-13; Philippians 1:1b; Ephesians 4:11-12; 1 Corinthians 12:28; 1 Peter 5:1-2; Acts 20:17). If there are believers who are unable for physical reasons to attend a church weekly, they should find a church or believers who will gather together with them regularly for worship in their own home (see James 5:14; James 1:27). God tells us in His Word to “not give up meeting together” (Hebrews 10:25). The Bible even goes so far as to call the church the “Bride of Christ.” If you love Jesus, you will love the things that He loves, and there is no one a good man loves more than His bride. The church is this important to God, so it should be ever-important to us. God didn’t call us to gather and worship to burden us, but to bless us. Church attendance can become one of the greatest blessings in you and your family’s life! Jesus lives inside of us by His Spirit when we believe in Him—this is a profoundly incredible truth! But there is also something biblically powerful about gathering together with other believers to worship. Jesus said, “Where two or three are gathered in my name, there am I among them” (Matthew 18:20). So He not only lives in us by His Spirit, but He is in the “midst” of us when we gather to worship Him. All of us long for community and connection with others. God has given us this gift in gathering together for church, and in smaller groups in each other’s homes. It fulfills something inside of us to do life with others, encourage each other and be authentically involved in each other’s lives. Christian TV, podcasts, books and conferences are wonderful additions to our spiritual lives, but nothing can take the place of consistent Christian community through the local church. It can be messy when we step into each other’s lives. We are all human, and no one is perfect. So it requires effort and intentionality and grace from God to do life together, even as believers. Gathering regularly with other believers becomes a refining process whereby we help each other, pray for each other and encourage each other to want to follow Christ more wholeheartedly. It is a truly beautiful thing. Article written by Matt Brown.